Albert Wilson was born on 15 April 1891. He was single, and in 1914 when Albert joined the 18th Battalion Durham Light Infantry (DLI), he was aged 23. 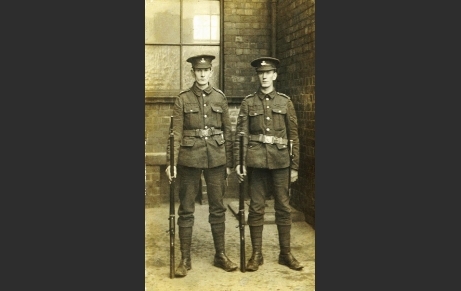 Albert and his older brother, Robert, joined the 18th Battalion Durham Light Infantry – the Durham Pals – at Cocken Hall on the day the battalion was formed – 21 September 1914 – and three days before recruitment officially started on 24 September. Albert’s number was 18/637 and Robert’s 18/651. Initially, Albert and Robert were both in A Company (although, when they died, they were both in C Company). On July 27th 1916, towards the end of the battle of the Somme, the Durham Pals took over a stretch of vulnerable front line at Neuve Chapelle. Instead of the more familiar trenches, the front line at Neuve Chapelle consisted of raised sandbag breastworks, and according to the official history of the battalion, much of it was in quite poor condition. Throughout the late afternoon and evening of 27 July, the enemy shelled the Durhams in their new front line, and then, as darkness fell, the enemy conducted a series of trench raids. It was fierce hand-to-hand fighting and eventually the enemy was ejected, but in the action the Durhams suffered heavy casualties. At sometime during this fighting, Albert was seriously wounded, and he died in Merville dressing station the following day. Private Albert Wilson is buried in Merville Communal Cemetery, France, and is mentioned in John Sheen’s (2007) book Durham Pals, pp120–121. The picture of Albert with his brother, Robert, was used by the local newspaper when reporting his death, a reference to it is on the back of the card. 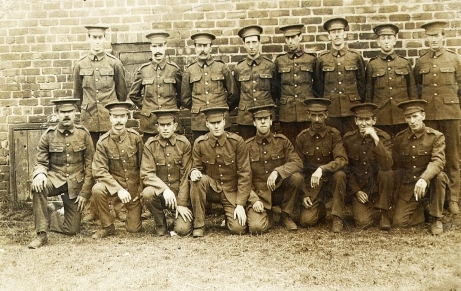 Robert can also be found on the group photograph of A Company taken at Cocken Hall. He is second from the right on the row of kneeling men, next to his brother, who is right on the end.